The Song of Roland is an outstanding example of a literary and musical genre known as a Chanson de Geste, or "song of deeds". 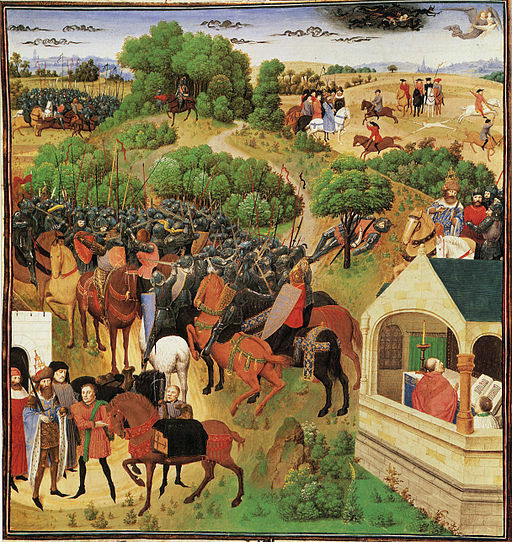 The Song of Roland tells the story of a battle between Charlemagne and Muslim forces. Interestingly, this was not accurate--Charlemagne did not fight any Muslim forces. Nonetheless, it because a popular story sung but paid storytellers at grand events as the main entertainment, and resonated with Europeans who were engaged in various crusades against the Muslim world in Spain and the Levant.